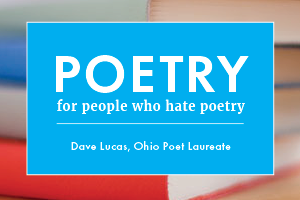 The new Poet Laureate of Ohio, Dave Lucas, has been appearing one week every month in Scene Magazine, with "Poetry for People Who Hate Poetry." Or, read it at the Ohio Arts Council site: 1 2 3. --He'll be reading in Arkon on November 21 at Latitudes Poetry Night (which happens the third Wednesday of each month, Compass Coffee, 647 East Market Street, Akron).